What’s so powerful about a powerfully bad smell? 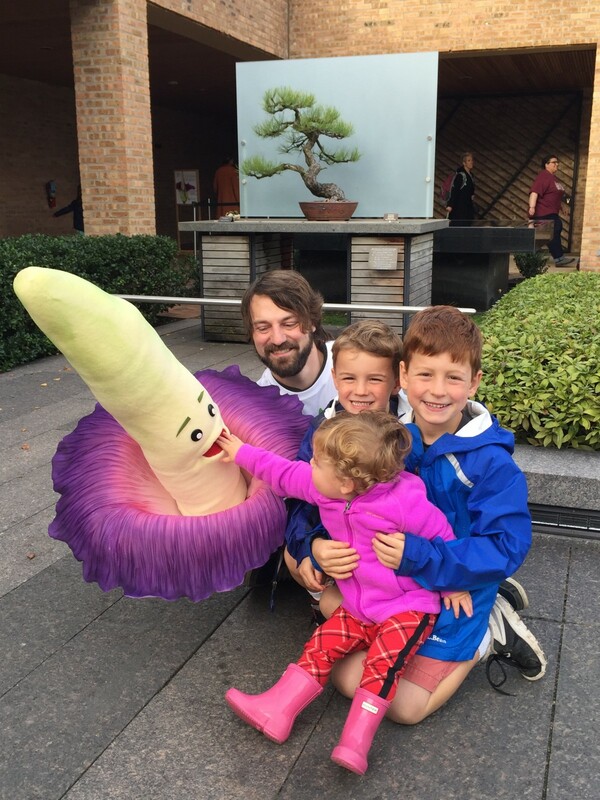 Having recently experienced the magical bloom of our titan arum Alice the Amorphophallus at the Chicago Botanic Garden, we were reminded of the pure joy that plants can bring. Alice provided special moments for many people—including me. 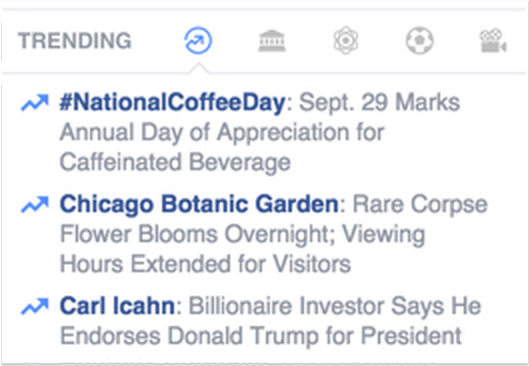 On September 28, at 12:51 a.m., I received a text from the Chicago Botanic Garden’s senior director of marketing, Jennifer Napier. 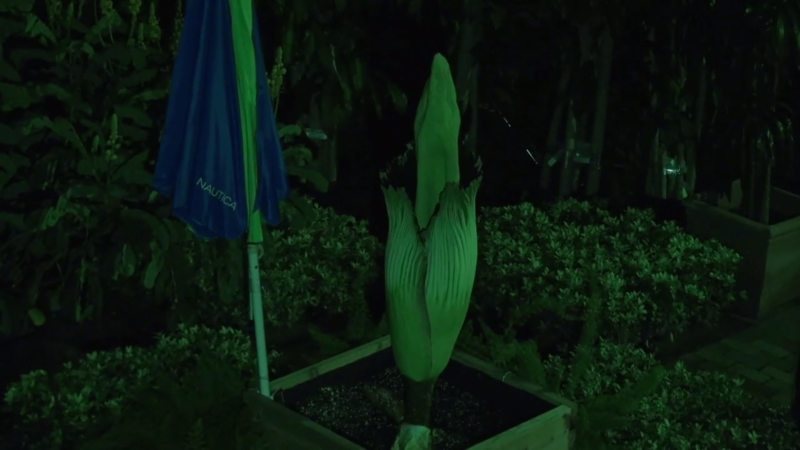 All night, she had been watching the feed from a camera trained on the plant we hoped would yield the result that our first titan arum, Spike, did not. She texted because she had noticed something incredible: Alice was blooming. That’s me! 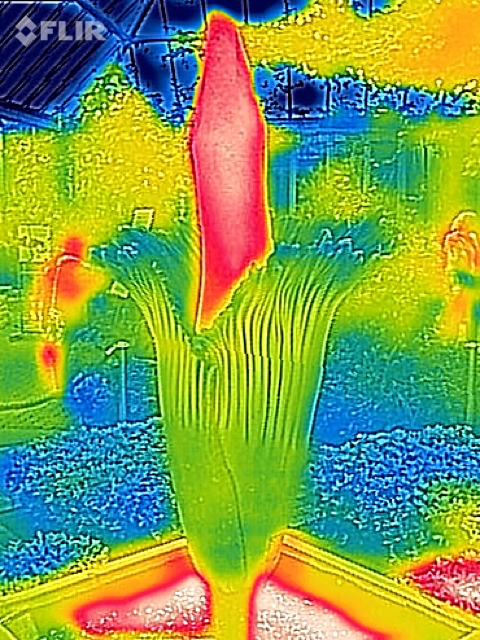 Pollinating Alice the Amorphophallus took steady hands and quite a bit of concentration. What a wonderful surprise. I took a breath and thought: This is it. This is what so many dedicated horticulturists at the Garden have been waiting for, and watching for, with our collection of eight titan arums over these last 12 years. I arrived at the Garden just after 3 a.m.—my headlights reflecting in eyes of the raccoons who call our 385 acres home—and was let in by the third-shift security officers who keep the Garden safe at night. At the Semitropical Greenhouse, I met outdoor floriculturist Tim Pollak, “Titan Tim,” and we breathed in the plant’s horrible, wonderful smell. Tom Zombolo, senior director, facilities and maintenance, joined us soon after. I don’t have scientific evidence to support this, but it was my impression that Alice “knew” we were there; maybe our warmth and carbon-monoxide exhales made the plant believe we were pollinators? I don’t know, but in the several minutes following our greenhouse entry, we perceived that Alice’s rotten scent became even more intense. There would be a lot of activity very soon, but we shared a quiet moment to reflect on this rare phenomenon and the extraordinary dedication of so many to reach this point. Later, thanks to Tim and scientists Shannon Still and Pat Herendeen, I had the chance to hand-pollinate Alice with pollen supplied by “Spike” and our friends at the Denver Botanic Gardens. That moment was one of the most exciting and moving experiences of my life. 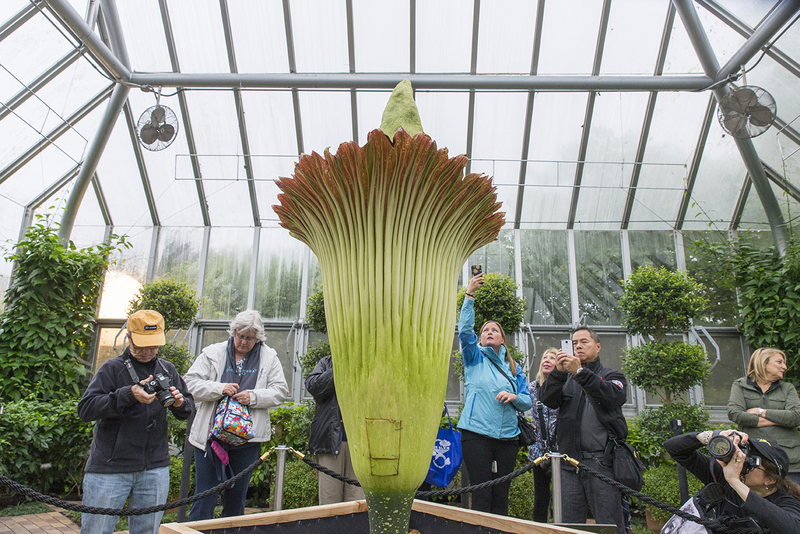 Alice was on view until 2 a.m. that night, and visitors of all ages patiently stood in line up to three hours to see, and smell, the corpse flower. I was grateful for the Garden operations staff, led by Harriet Resnick, who—in ways large and small—made the experience so satisfying for our visitors. More than 20,000 people visited Alice, and it was such a happy occasion for all. Twitter tells the story: #CBGAlice inspired and amazed visitors September 29-30. Help us harness the power of plants to engage our senses and our communities—sponsor a program through our Annual Fund today. 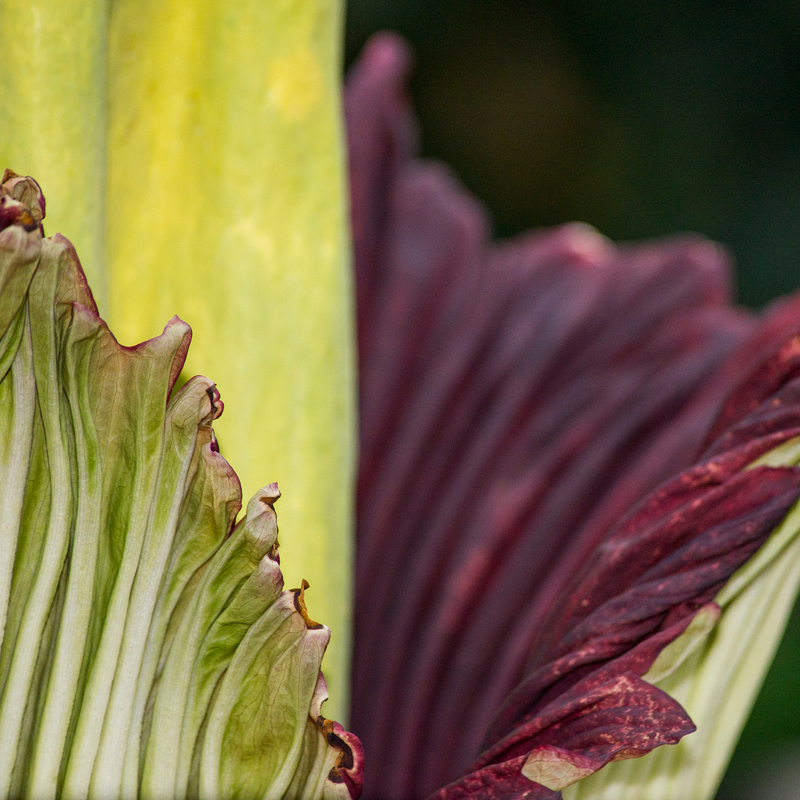 Alice has now returned to the production greenhouse, joining the seven other titan arums in the Garden’s collection. 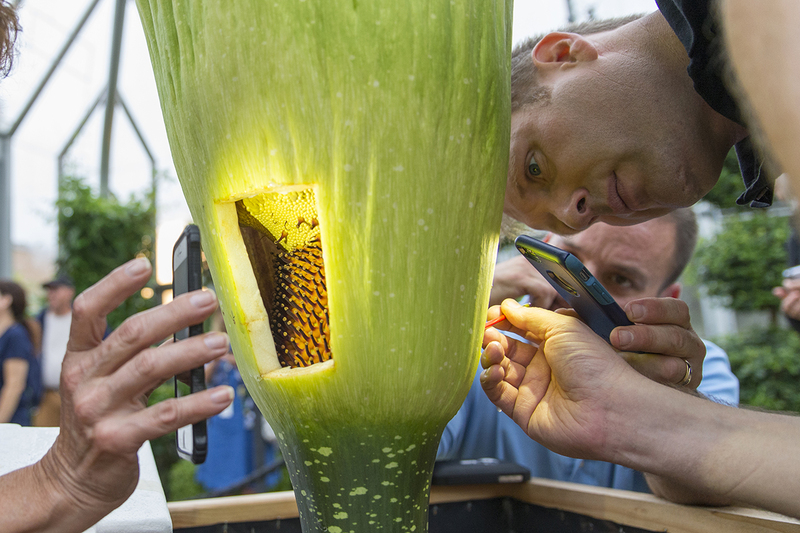 Will serendipity happen again with another corpse flower bloom? Nature will determine that. But I do know these kinds of special moments truly reflect the power of plants to educate, inspire, and bring joy. 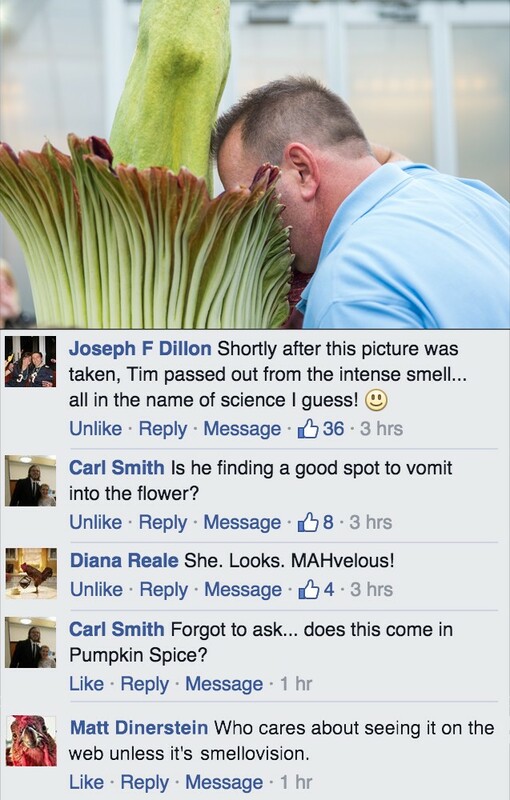 Posted on October 21, 2015 October 19, 2015 Author Sophia ShawCategories Community Gardening, Garden NewsTags #CBGAlice, #CBGSpike, alice the amorphophallus, amorphophallus titanum, blooming, corpse flower, titan arumLeave a comment on What’s so powerful about a powerfully bad smell? 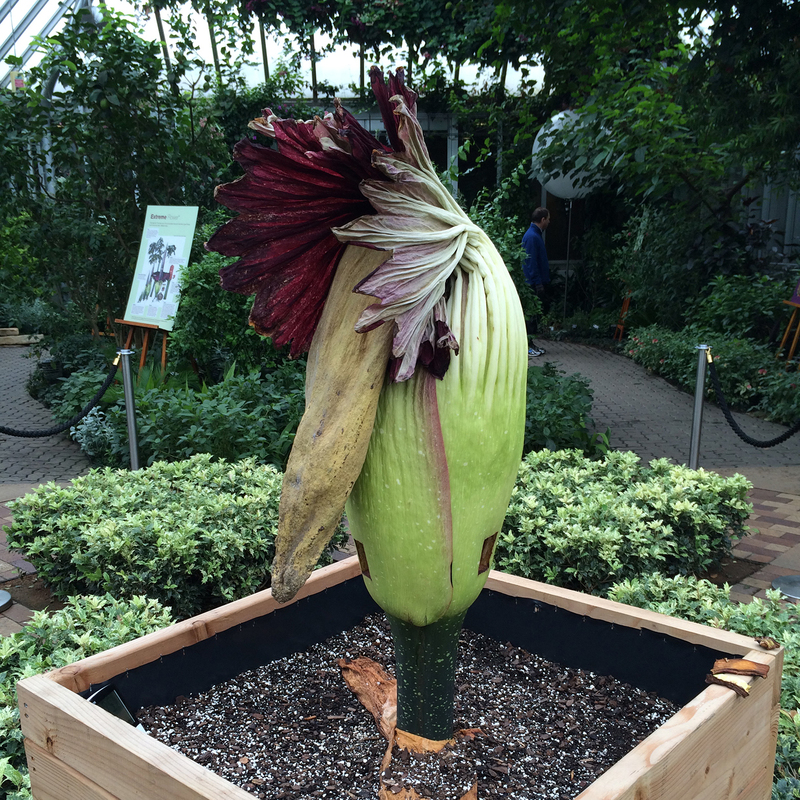 It is our pleasure to introduce another titan arum (in bloom! 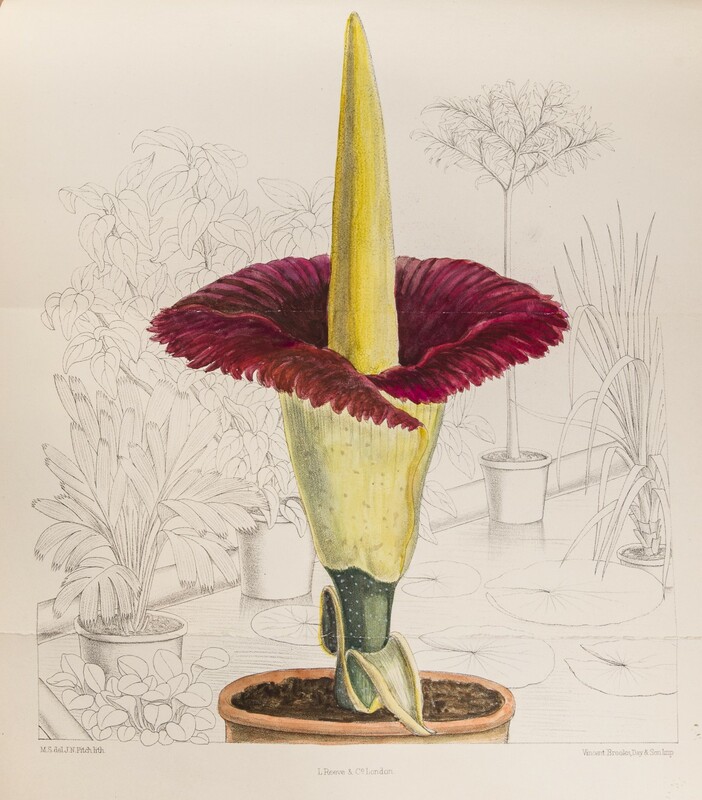 ), which we have joyfully named “Alice the Amorphophallus.” Given the history below, it’s a name to remember! Alice will be on display in the Semitropical Greenhouse through Sunday, October 4—view what she looks like now on our webcam. 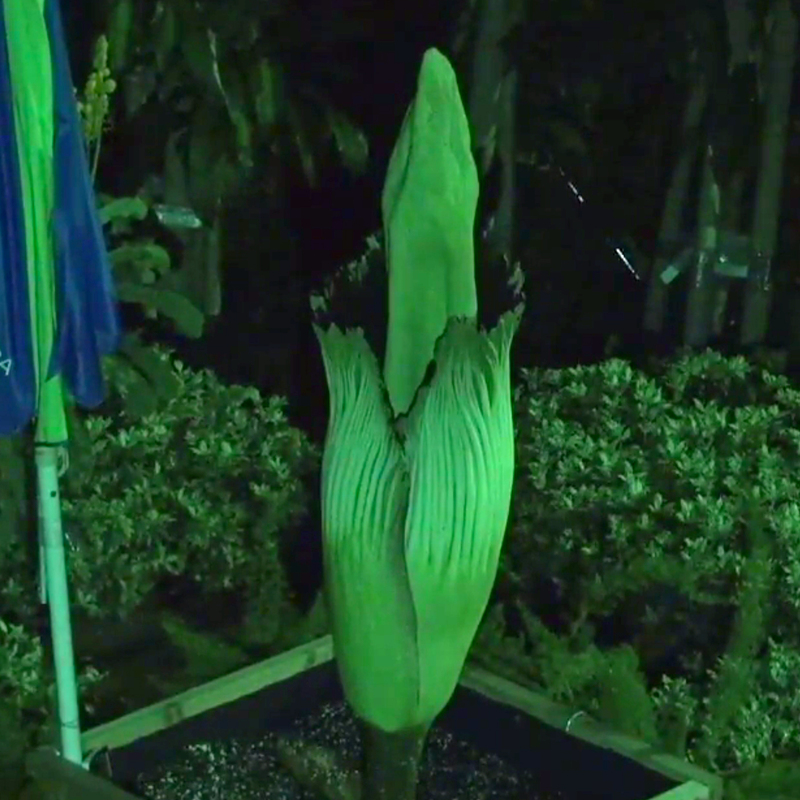 Alice the Amorphophallus is caught blooming on webcam at 12:22:39 a.m. today—the Semitropical Greenhouse may smell a bit funky this morning. 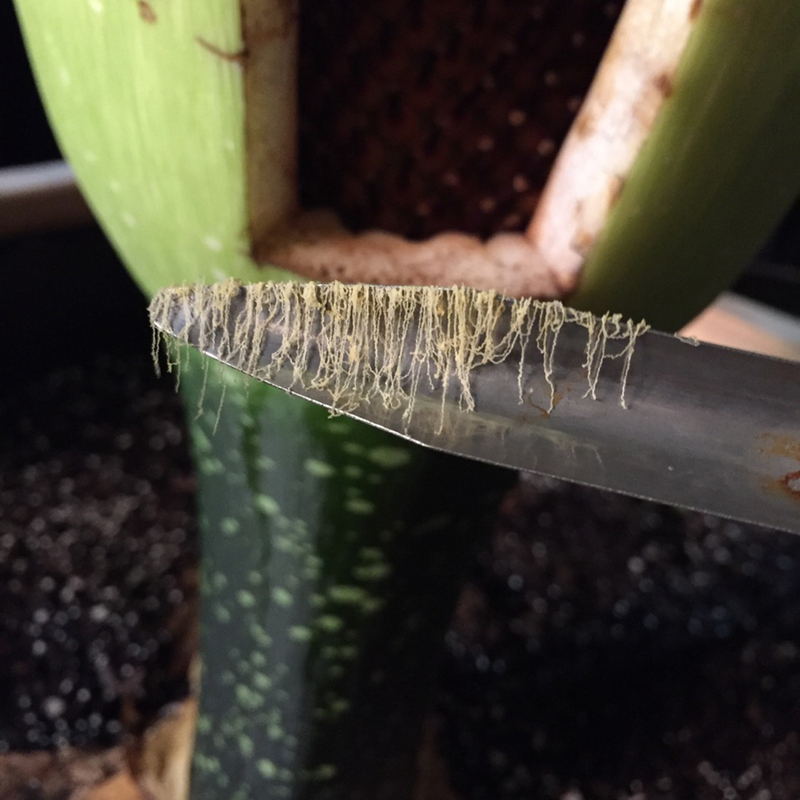 When the Chicago Botanic Garden’s first budding Amorphophallus titanum presented itself, we called it “Spike,” since the flower structure, or inflorescence, is also known as a flower spike. But the true name of Spike (and Alice) is a title that can make you blush, do a double take, or send you running to Google. 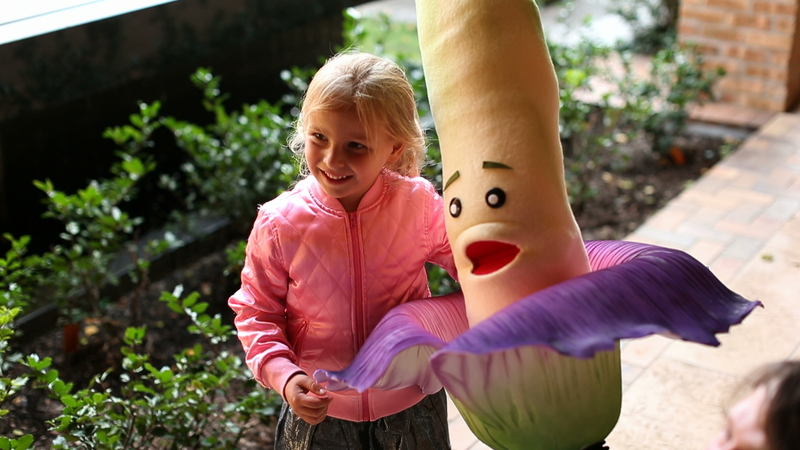 How did Amorphophallus titanum end up with that name? First, imagine a world where the same plant was called different names in different languages in every town in every valley in every country around the globe. It existed before 1753, when the great botanist Carolus Linnaeus brought order to the chaos with his famous work titled Systema Naturae. His simple system of binomial nomenclature allowed the world to speak the same language when it came to plants. It was no coincidence that the chosen tongue was Latin—the only language acceptable to all (at least in Europe), as its native speakers no longer existed. Linnaeus created the scientific shortcut of categorizing plants by their flowers and fruit (leaves had already been tried and abandoned). The elegant system caught on, and Linnaeus himself named some 9,000 plants before his death in 1778. Some of those plant names continued a long-standing practice: using the nomenclature of the human body to label the botanical world. The Greeks had done it: they chose the word Hepatica (hepar = liver in Greek), as the name for plants with tri-lobed leaves that look rather like a human liver. The Romans coined the familiar name Pulmonaria (pulmo = lungs in Latin) for the perennial with spotted leaves that suggested a diseased lung. Likewise, Linnaeus named a genus Podophyllum, because its leaf resembled a foot, and named another Digitalis—and what gardener hasn’t slipped a fingertip into the flower of a foxglove and admired how neatly it fits? A century after Linnaeus, during the great age of plant exploration in the mid-1800s, ships from many countries were crisscrossing the seas in search of riches—including rare and exotic plants. Jump forward another century and, in 1995, Sir David Attenborough presented a BBC show called The Private Life of Plants. 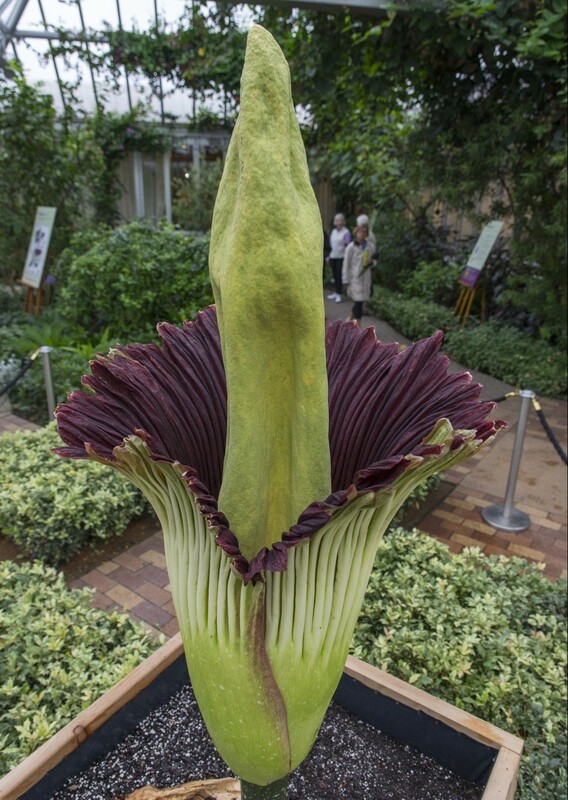 In the episode about flowers, he introduced A. titanum to viewers with a new “common” name: titan arum. Attenborough felt that the Latin name was inappropriate for television audiences. Today, as titan cultivation succeeds at more and more botanic gardens and academic institutions, it has become popular to personify these giants of the plant world with nicknames. Some have been rooted in botany (“Carolus” at Cornell referenced Linnaeus himself), some steeped in mythology (“Hyperion,” the thinking man’s Greek titan, at Gustavus Adolphus University), some simply named with joy and humor (“Bob,” “Morticia,” “Tiny”). 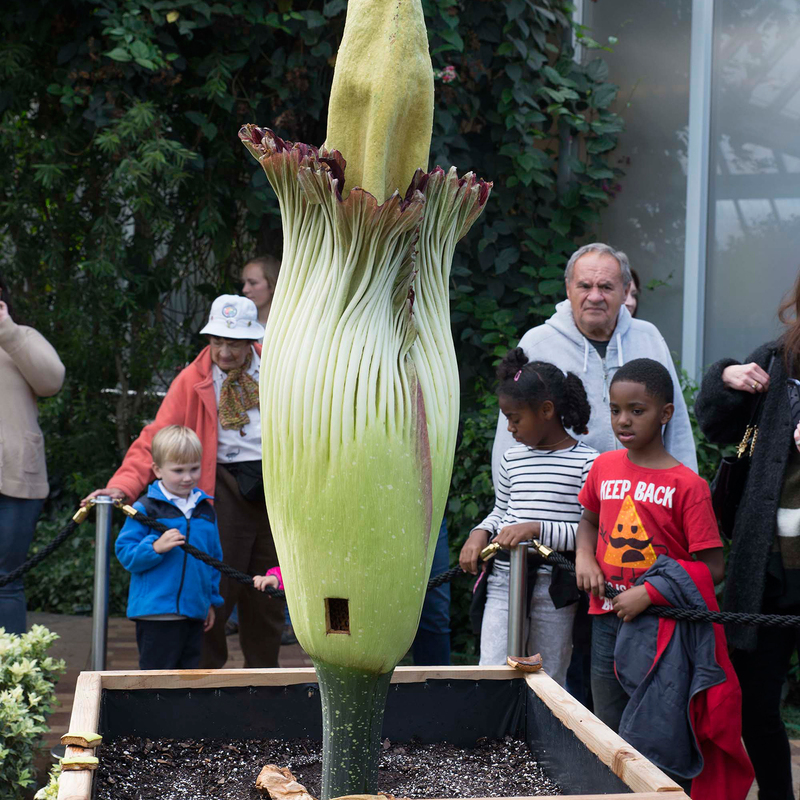 Early morning visitors to #CBGAlice enjoy a snootful of stench from the blooming beauty. The flashlight apps of several cell phones light this morning’s pollination activities. 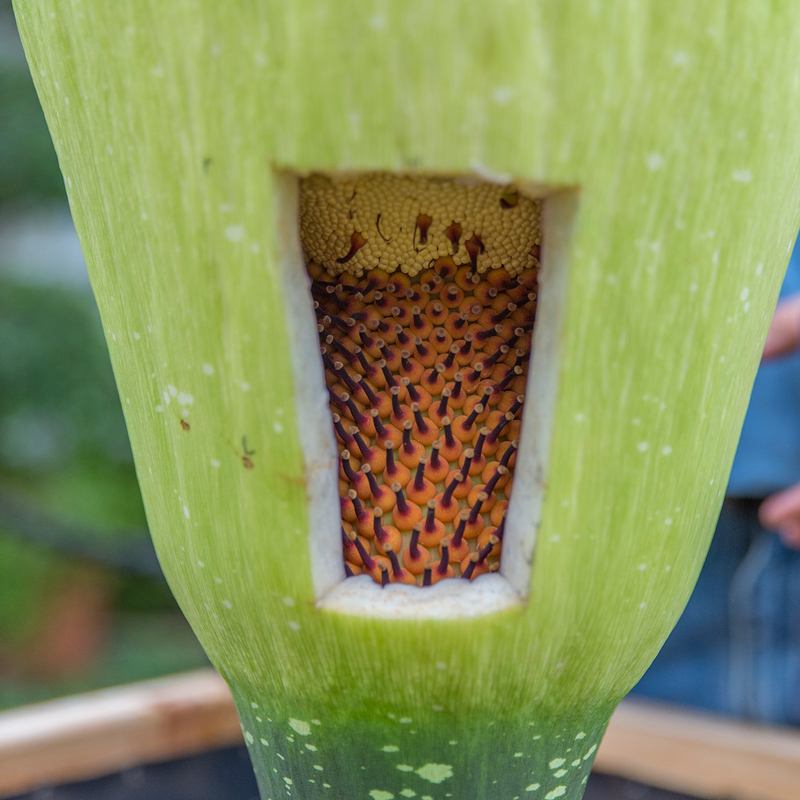 Dr. Shannon Still wields a paintbrush laden with pollen, brushing it lightly on the female flowers on the spadix. 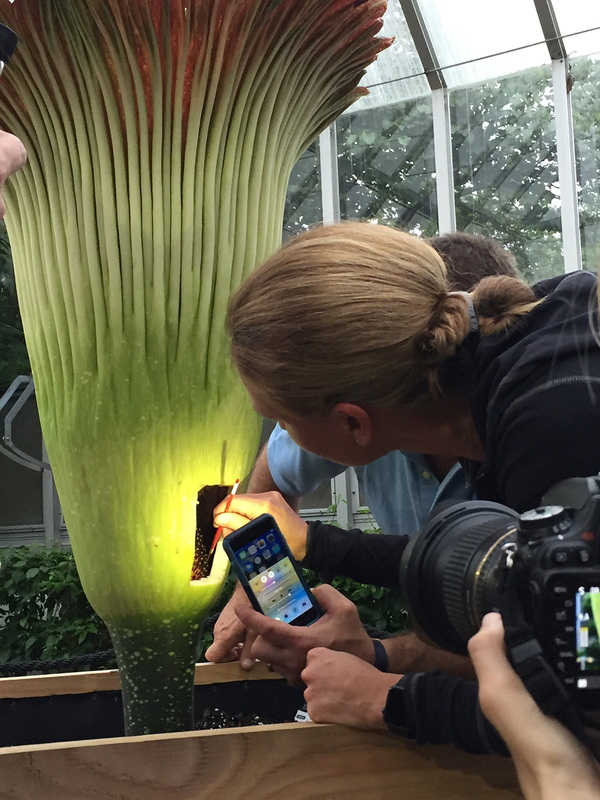 Phones and cameras are out in force today to capture the magical titan arum bloom. 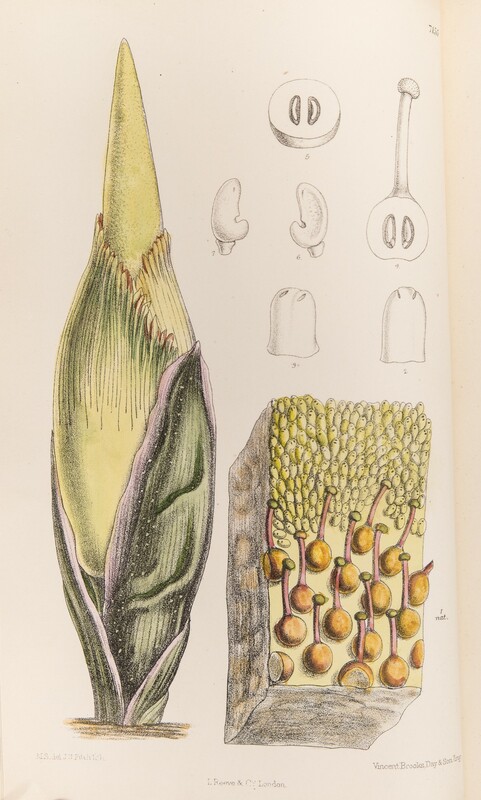 The square in the back of the flower is the replaced spathe where pollination occurred moments earlier. 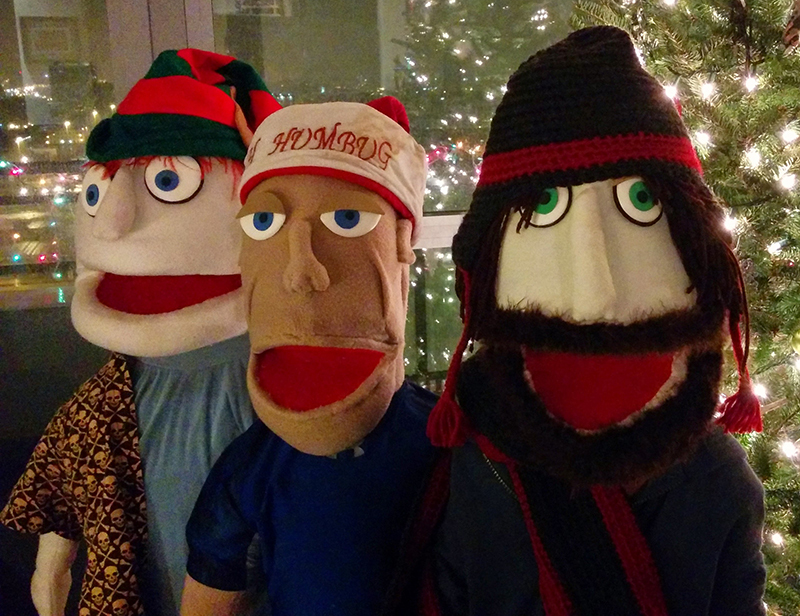 We hope you enjoy your visit with #CBGAlice! Please check our website at chicagobotanic.org/titan for info on the bloom. The live webcam will remain on through Sunday, October 4, 2015.